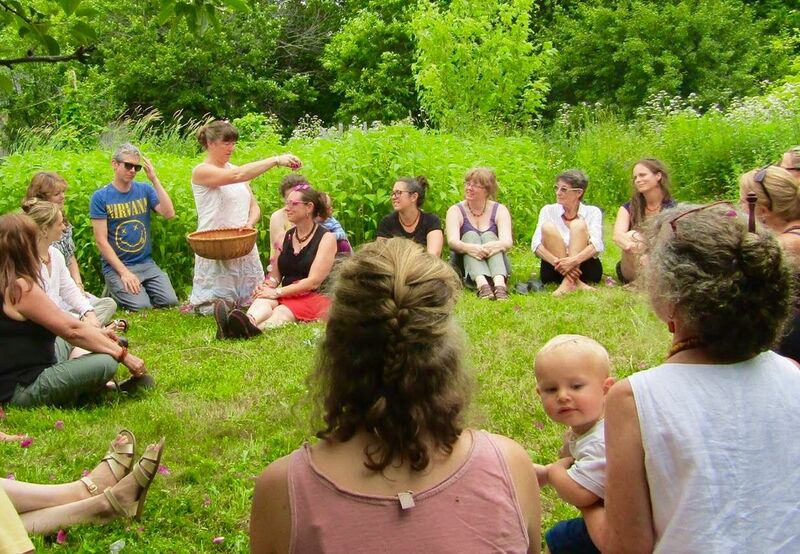 We invite you to join us for our Community Herbalist Retreat - an annual three day plant centered celebration for practicing and aspiring herbalists, held in a beautiful rural Maine setting during the height of summer. Our theme this year is Digging Deep into the Ancient Soul of Plant Wisdom. We have an absolutely fantastic weekend of non-stop herbal learning in store for you! Our retreat setting is the Blessed Maine Herb Farm - our lush herb gardens and the woodland, waterways and fields that surround us. We'll have use of our School House at the edge of the medicinal herb gardens for indoor classroom space and a tent as needed, and will plan plenty of enjoyable time for walking the Medicine Trail and splashing around in the Wesserunsett Stream between formal classes. The Community Herbalist Retreat is a relaxed, intimate, inspiring and rejuvenating time spent in the slow lane among the plants and with those who share a love of herbal medicines. This sense of community, of building a cohesive plant honoring, reciprocal, eco friendly, woman centered, entirely magical, deeply spiritual, loosely woven, yet immensely supportive group of like minded people, all coming together for the weekend...well, it's a lot of fun and it's an excellent herbal learning experience, on so many levels, and, honestly, it's deep soul nourishing inspiration of the finest kind. Bring your notebook, yes, but also bring your curiosity, your child spirit, your willingness to enjoy and relax, to share, to drop your mask and relate soul to soul in a loving and supportive plant centered community setting. Herbal Medicine class teachers and school directors, please note: your students are eligible for a 10% reduction in their registration fee. Email gailea88@gmail.com to make arrangements. Come play...we'll be celebrating our beauty, deepening our understanding of the medicinal as well as magical properties of plants, making soap, essences and amulets, visiting a local sacred landmark, practicing plant identification skills...we're going to rock ceremony, prayer, dream, storytelling, singing and of course, our morning yoga...while enhancing our sense of mutual support as we build confidence and skills necessary to move forward as community herbalists. Seven fabulous meals and all materials are included. Our weekend begins on Friday morning (arrival/ set-up between 10AM-11:30) and continues to mid-afternoon on Sunday. We will be updating our Retreat offerings for 2019 over these next few weeks. Making your own soap is a fun, creative, economical and mindful process. We will look at saponification and safe practice, cold vs hot process, oils (vegetable vs animal) and their roles in the qualities of the soap you want to make, additives such as plant materials, essential oils vs fragrance oils and equipment. If you want to take part in the process please bring safety glasses, thick-ish dish-washing gloves (the better quality ones from the grocery store) that come up to near your elbow and an apron. We will make a batch big enough for everyone to bring home a bar. Susan Theberge is a Pharmacist, Community Herbalist, and a member of the teaching staff at Blessed Maine Herb Farm School of Herbal Medicine. She lives on a homestead in the Western mountains with her husband, dogs and cats. Susan gardens, tends her woodlands, prepares herbal medicines, and serves the community as a pharmacist. Morning Yoga with Martha - Honoring the Plants - In this unique gentle yoga class we will hold space and honor our connection with our beloved plants. Some Qigong energy and meditation. Suitable for all levels. Bring your yoga mat! Martha Ross-Vignola has taught yoga and guided meditation for adults and school children for many years in the southern Maine area. As an herbalist, Flower Essence and Reiki practitioner, Martha shares, through her yoga, our living connection with the plants from grounding roots to flowering sun-filled faces. Blessed Essence - Kathy Gray - So many participants of the Blessed Maine Herb Farm Community Herbalist Retreat have expressed gratitude for the deep sense of community and support they find there. Wouldn't it be great if we could bottle that feeling up and send it home with everyone? Well...let's do exactly that! Kathy Gray will lead us in creating a vibrational essence to harness that sense of support, acceptance, and unity. Everyone will have the opportunity to contribute and take home a bottle of �Blessed Essence� as a reminder that we are always one in spirit with each other and the plants. Solstice Ceremony - Kathy Gray and Deb Fate-Mental will perform a special fire ceremony in honor of the Solstice. We will have the opportunity to release that which no longer serves us and welcome fresh, new energy into our lives. This will be an event full of symbolism ~ with drumming, energy clearing, a little drama, and infinite transformative potential. We will be gathering herbs for magical purposes, as is traditional on this sacred night, after the ceremony. Kathy Gray has wildgathered plants for food, medicine and art since she was a child. She is a Reiki master and has practiced energy work for over 25 years. She has worked as a formulator at a chaga company and loves to experiment with and create new products. Kathy has homesteaded off-grid in the Maine woods for 10 years. Shamanic Journey to the Ancestors, Deb Fate Mental - Our Ancestors are always available to support us! In a series of shamanic journeys we will visit our Ancestors, both human/blood lineage ancestors, spiritual ancestors/teachers and - since plant people have plants in their spiritual lineage - we'll meet a plant ancestor, too. Deb Fate-Mental is an archetypal Wise Woman and has been in practice for almost a decade. Her healing expertise combines traditional plant lore with authentic, old-fashioned shamanism and spiritual healing. Deb helps people Remember themselves via healings, classes and readings so they may re-connect with Nature and the Divine. Deb is currently writing a book and is a Druid-in-training. An Invasive Plant is defined as �a plant that is not native to a particular ecosystem, whose introduction does or is likely to cause economic or environmental harm to human health.� In this class we will discuss the concepts of native & non-native plants as part of a dynamic Earth, the politics, economy & poisons of the �war� on Invasive Plants, the medicine & healing that these Invasive Plants can offer living beings & ecosystems, their ability to address invasive dis-eases, & why calling upon these plants for medicine can help protect at-risk & endangered plants. We will talk of medicinal & culinary ways to call upon some of these plants, & feast on some during the class. Suzanne Stone has been fortunate to study herbs & to teach children about the plant world for much of her life. Along with her own research & life experiences of learning from the plants & herbs themselves, she has studied at the Elderberry School of Botanical Medicine in Portland, OR as well as with our beloved teacher Gail Faith Edwards. She currently teaches a five month hands-on herbal medicine making course, among other courses, on the coast of Maine, under the name of Moon of Hyldemoer Herbals. Let's Talk About Herbs and Breastfeeding - Natalie Hessell - Breastfeeding parents use herbal medicine too! But questions come up about which herbs are safe, which herbs can help to increase or decrease supply, and which herbs may be used for various ailments like mastitis. We will discuss herbs and lactation from a historical and nutritional perspective as well as looking at new research and information available. Natalie Hessell is a community herbalist and holistic IBCLC. She has a private practice in the midwest, as well as working as a lactation consultant for a dental practice where we release oral ties. She is a mom to 4 kids ranging from preteen to 21. Herbs for the Skin - Celebrating Our Beauty - Janet Edwards - Janet will talk about all natural skin care with student centered hands on demonstrations including an herbal steam, oatmeal scrub, a hydrating mist and moisturizer. Handouts will be available. This has become an annual treat and is always an awesome and highly enjoyable class! Janet will have some of her excellent beauty care products available for sale. Janet Edwards began her plant education in her grandmother's garden at age 4 when she was presented with a peppermint leaf to chew. She is a self taught wild hearted herbalist who has attended many workshops, has spent years in her own gardens with the plants and has a large gardening library. She grows most of the herbs she uses in her products and produces her fabulous skin care line under the name of Mountain Mama of Maine. Fa Lo Santuccio, Do a Little Holy Thing - - Gail Faith Edwards - The practice of Benedicaria is all pervasive in Southern Italia. So much so that it did not have a name until the great emigration to the United States and elsewhere. These spiritual practices and traditional ways of restoring health to body, mind and spirit, long referred to as "just the way we do things", became known as Benedicaria, a term that links spiritual faith, from the dawn of time, to our physical well-being. We're going to explore pharmacopeia and practices of the Benedetta, and also continue to deepen the dream work we began last year. Gail Faith Edwards, is a Community Herbalist with more than thirty five years experience. She is the author of several books on herbal medicine, operates a vibrant medicinal herb farm, school and herbal products business and consults with clients. She teaches internationally, leads sacred journeys to Southern Italy twice a year and has students around the world. Martha Vignola will start our day off in beautiful form with a gently paced Hatha Yoga class to open the body, the mind and the heart in preparation for a day of learning and sharing. Friday night story telling - Gail will read the Story of the Crescent Moon Bear, or the orso della luna crescent, with a Sud Italia flair. This tale reveals to us the path we must take to true healing, for ourselves as well as those we work with as community herbalists. Saturday morning we�ll head over to South Solon and visit the South Solon Meeting House. It�s one of our local sacred treasures, the walls are covered with amazing frescoes. We�ll walk around outside the building and see what local plants we can identify. Solstice Celebration - Saturday night we'll gather together around the campfire for a traditional Midsummer celebration. After a fire ceremony with Kathy Gray and Deb Fate Mental, we'll gather herbs in the moonlight for magical purposes, dry them by the fire and on Sunday morning we will craft protective amulets with them. SEVEN EXQUISITE ORGANIC MEALS AND CAMPING ARE INCLUDED IN YOUR FEE. All our meals will be freshly prepared with local, organically grown produce, and this is included in your fee. In fact, our mealtimes are sure to be one of the many highlights of our time together! Our chef, Rosa Jane Rosario is a master of the culinary arts and is well known and respected for her food preparation skills as well as her beauty of presentation. She was raised on the Blessed Maine Herb Farm, where she studied by candlelight and learned to cook on a wood stove. Her love of preparing fresh wholesome meals with local ingredients began when she was a young girl, the eldest of four, who loved nothing more than to go out to the garden, gather a basket full of fruits and vegetables, bring it back to the kitchen and proceed to create a tasty meal. Proud of her Italian heritage, Rosa has traveled extensively throughout Italy and regularly spends time in her ancestral village in the Apennine Mountains of Southern Italy. Italian culture�especially its approach to the culinary arts�has greatly influenced both Rosa�s relationship to food and the way she views her role as a community chef. A highly skilled and creative cook who has mastered a diversity of food preparation styles, Rosa knows that the most important ingredient in any meal is love. Choose your camping spot in the herb gardens or up in the new orchard, next to the newly planted pollinator habitat, an acre full of native wildflowers. The views are beautiful up there and the sky is so big. You can get fresh wild water at the spring or use the water provided from our kitchen. It all comes from the same fabulously pristine source, an ancient glacial lake buried deep under the earth here. You will need to bring a tent and camping supplies if you intend to camp, a knife, basket or bag, notebook and pen, and personal items of choice. We have a limited amount of rustic indoor sleeping space for those who prefer indoor accommodations. You will still need to bring a sleeping pad, blankets, etc. Please let us know when you register that you would like this choice. Again, these spaces are limited and assigned on a first come, first served basis. A list of local motels and bed & breakfasts will be provided to those who ask. We welcome your nursing infants and toddlers, however they will not be permitted into class sessions, unless sleeping in their mother's arms or actively nursing. We will have a child care area set up with a caretaker and planned activities during class sessions. There is a $50 additional charge for child care, to compensate the caretakers. See the link below for this service. Please note that the retreat is a smoke free zone. Dogs, drugs and alcohol are not permitted. We ask that all cell phones be turned off during classes and we have a strict no cell phones in the gardens policy to protect our pollinators. You may use your cell phone, as necessary, in the driveway area. 7 - 8:30 Melissa Boynton will be available in the herb gardens to introduce you to plants as sentient beings. She will be discussing Heart centered Herb Gardening, Harvesting and Processing. 1:15 � 2:15 Invasive Plants with Susan Stone. 7:30 - 11:15 Melissa will be in the gardens - you are free to walk the Medicine Trail down to the stream. 8:30 - 10:00 � Creating Protective Amulets and Fumigation Wands/Smudge Sticks. 10:00 - 11:00 - Barter Fair! Bring your herbal or other creations to trade! Note: If you are staying off the farm please arrive in time for the opening ceremony at 12 noon on Friday. Register and pay in full for the Community Herbalist Retreat at the link provided at the top of this page. If you are a currently enrolled student in any herb school in New England, you are eligible for a 10% discount on our registration fee. Email gailea88@gmail.com for information.